Governor Ralph Northam today announced the winners of the 2019 Governor’s Challenge in Economics and Personal Finance. More than 3,000 high school students from across the Commonwealth participated in an online competition, and 160 students were invited to the day-long championship event held April 11th at Capital One in Richmond. 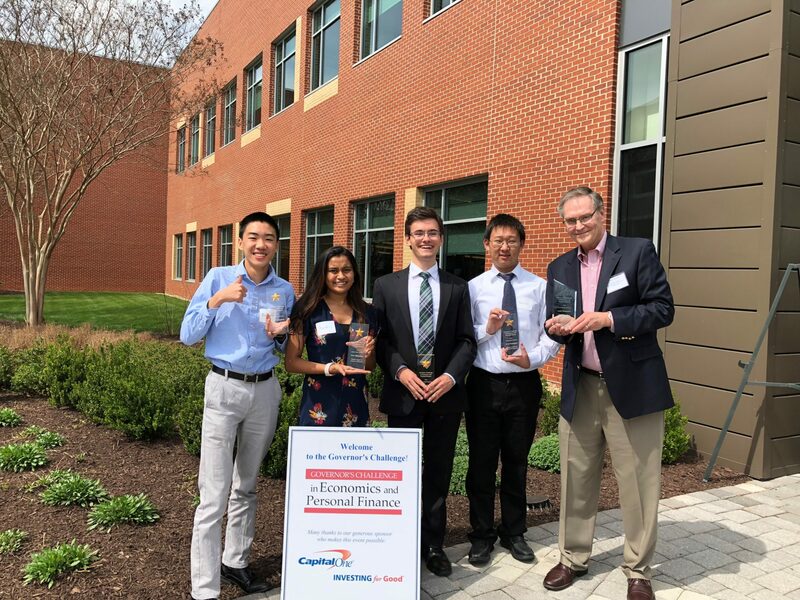 Maggie Walker’s four-student team, consisting of Alex Nikolov (’19-Henrico), Kevin Ren (’20-Chesterfield), Aashri Aggarwal (’19-Henrico), and Richard Zhai (’20-Henrico), competed against 15 teams, including 9 teams from Northern Virginia high schools. To be invited to the state finals, all teams took online tests and the regional winners (including Maggie Walker) and other high scoring teams were then invited by the Virginia Council on Economic Education to the state finals competition. The next step is the National Economics Competition, which is in New York City the weekend of May 18-20. The Maggie Walker team is now a semi-finalist and will take proctored tests at the school on Wednesday, April 17th. The results will be compared against semi-finalists from other states. If successful, Maggie Walker’s team and their teacher, Dr. Oreska, will be one of only eight teams who are invited to the National Economics Competition championship in New York.